Charles Ross & Son Company, a manufacturer of mixing, blending, drying and dispersion equipment since 1842, accepts custom fabrication projects for virtually any application. 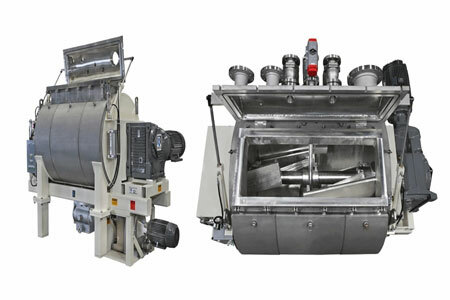 Engineered and built based on customer-defined design specifications, pictured is a heavy-duty Horizontal Paddle Blender with a working capacity of 450-gallons and stainless steel 304 product wetted parts. Designed for vacuum up to 25” Hg and 5 psig internal pressure, the cylindrical trough includes a pneumatically-operated dome cover and 150-psig three-zone heating/cooling jacket. The solid one-piece agitator shaft featuring special kneader/paddle blades turns at 5 – 45 rpm and is driven by a hollow bore right angle heavy-duty gear reducer with 75 HP explosion-proof, constant-torque motor. Batch weight is measured by load cells rated for 6,000 lbs. A 20 HP extraction pump assembly is located at the center bottom of the trough for efficient discharge of the finished product at a precise and constant flow. Aluminum split stuffing boxes on both ends of the agitator shaft are supplied with Teflon square packing and bronze lantern rings for air purge. Low pressure compressed air forced into the packing through the lantern rings creates a positive pressure barrier preventing product from penetrating the seal. Optional factory acceptance test and inspection are offered on all Ross equipment.